We're heading to to Brussels, Belgium mid-week. It feels like we've been planning this trip for ages. As soon as there was an inkling we might be moving to Europe, we started researching a long weekend trip to see an F1 race. (My husband is an avid fan and watches every race yet has never seen one in person. We missed both the Spain & Singapore races by less than a week.) A couple of Joe's old university roommates and good friends of ours are also flying across the pond to join us. Friends, beer, cars, races, Europe = a recipe for success if you ask me! 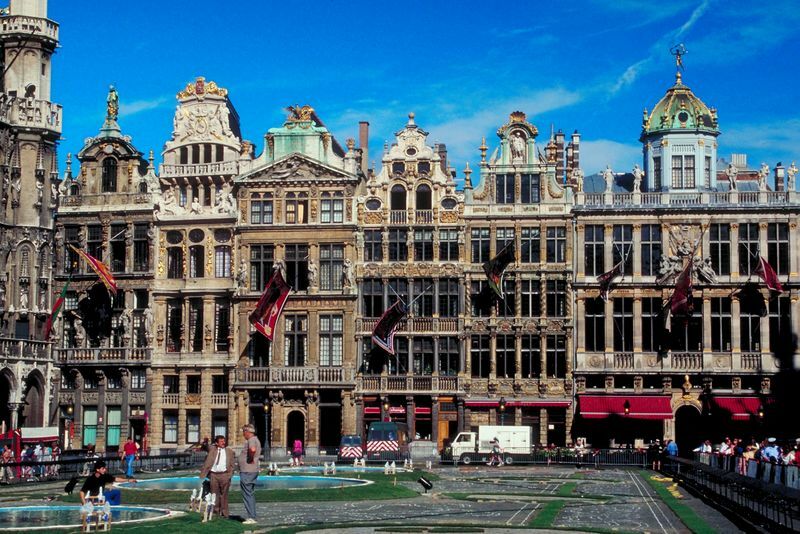 Have you ever visited Brussels? Any tips? So exciting! We're heading to Bruges in September. If you get any great Belgium tips let me know! It's been quite a while since I've been to Brussels, but I think I can come up with a few things, when do you need to know? We're heading to Brussels for the Beer Festival on Saturday! I've never been before, but I keep hearing to go visit this Neuhaus chocolate outlet on the outskirts of town. Supposedly it's divine! Hope you have fun! We spent three days in Brussels in April. The beer is great, the chocolate is great, the city is... surprisingly dirty. There was trash in the streets, dog poo everywhere, and really just dirty, which was surprising for a city of its stature. There is some great art deco architecture, and the Atomium is interesting. It was surprisingly affordable, too, for the area (I know it won't be expensive to you, coming from Norway, but it's still not a cheap place to eat!!). you are heading to belgium?? do you know how jealous i am of you right now?? you are so so lucky!! enjoy! i have never been to brussels before but the only tip i cam tell you is have fun which im sure you will! i'm so jealous, please have a beer (or two) for me! the beer options in Costa Rica are very limited and I am missing good brews!! Had to reflect on Gesci's point above. Brussels is definitely on the grittier side compared to other European capitals and I've always wondered why. I can only think that no one really takes ownership of it with so many different populations living here (Bruxellois, Flemish, Walloon, the EU crowd, expats, corporate, North Africans, Congolese, etc...) The trick is to look up as most of the great architecture is tucked away at the top of the buildings. Also, you'll pass from one great area to another not-to-nice area very quickly in Brussels... as long as you keep that in mind, you'll be fine. Neighborhoods change very quickly here. For touristy things, obviously the Grand Place is a must. Have a drink at the Roi des Belges on the square and stare at the buildings for awhile. If you look to the tops, you'll see statues pointing to each other around the square. The Royal Palace is open until September 9th and is worth a visit. One ceiling is completely green inside, made with the wings of a million Thai beetles (yes, that sounds odd, but trust me, its worth seeing). The Petit and Grand Sablon squares are beautiful and also home to the cities best chocolate shops. My favorite is Pierre Marcolini. If you have time and it is nice outside, take the metro to Laaken where there is a huge park with a Chinese Pavilion tucked away in one of the corners. It is beautiful...but very huge...so only go if you have access to a car & lots of time. For the average Brussels expat experience, have some drinks on Place St Geris or farther away on the preppy Place Chatelain. L'Archiduc is a great cocktail place that has still kept its 1920s atmosphere. Wander around the St Catherine area for some great restaurants like Strofilia (Greek) or Brasserie Royale (a Belgian upscale classic). For lighter fare, eat some Mama Roma's pizza (by the kilo) or some fun tapas at Como Como. If you want to go really dressy, hit Belga Queen - worth it for the ceiling alone. For loads of recommendations, see the http://bestofbrusselsblog.com/ Really the best log of what to do in the city. And if the grittiness really gets to you, hop on a train from Gare Centrale and head to Antwerp, Gent or Bruges :) All three are gorgeous. If I wasn't headed to the States, I would offer to buy you a beer. Instead, I will have to read your post about it! Enjoy!! Have never been to Belgium, but have always wanted to visit! Enjoy F1 and eat lots of waffles :) Can't wait to see all the photos when you get back! I thought Brussells was great, although I was stuck there during a transport strike so there were men hanging around the streets and I got severely harassed. Whistles and hissing....lovely! I did visit a museum that had Faberge Eggs that were spectacular! And an Asterix and Obelix museum too! You have to, HAVE to eat a waffle or two for me!!!!! Oh my gosh, how cool! Lucky lady! I am Belgian, but I've never been to Brussels. Safe travels and report back! Can't wait to see the pictures. So cool! Eat some delicious chocolate for me! HAVE FUN!!! I have never been and am super jealous!! Brussels is my hometown. it's beautiful & awesome and you will definitely meet the friendliest people ever and be able to eat delicious food. How very exciting, Belgium is definitely high up on my places to see list. I'm sure you will have an amazing time and I can't wait to see photos!